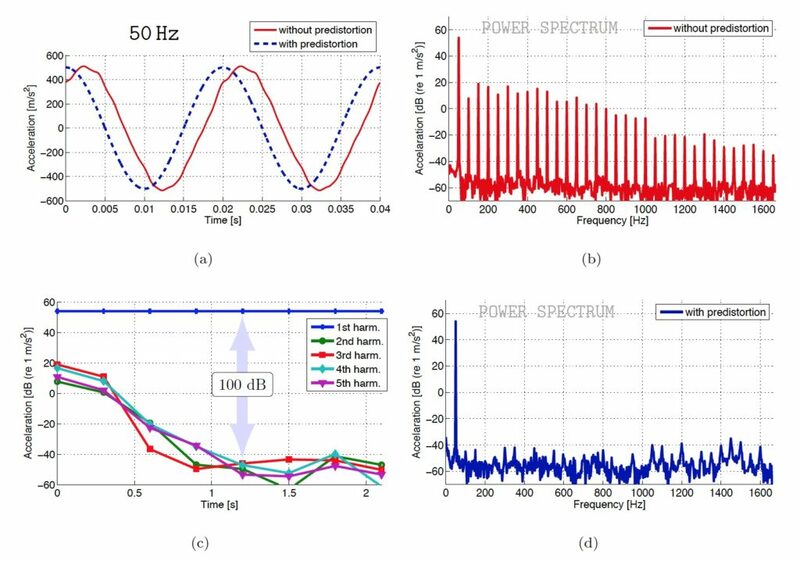 A. Novak, L. Simon & P. Lotton (2018), “A simple predistortion technique for suppression of nonlinear effects in periodic signals generated by nonlinear transducers”, Journal of Sound and Vibration. Vol. 420(0), pp. 104-113. When we need to do a measurement of a nonlinear system, we usually use an excitation device (e.g., amplifier, loudspeaker, shaker) that can provide the desired energy (e.g., electrical, acoustical, mechanical). Unfortunately, these devices are very often nonlinear and can spoil the measurement by their nonlinearities. To overcome this problem, we propose a simple nonlinear technique, that can provide spectrally clean signals at the output of these devices. The following videos show the recordings from the measurement on a shaker loaded by a rod. An accelerometer, stuck to the moving part of the shaker is used as a reference for the linearization. Two graphs are shown in the video. The left one shows the waveshape of the acceleration, the right one the power spectral density of the acceleration. The red color represents the state (not varying with time) of the shaker's acceleration without any predistortion; the blue color is the actual state. When the predistortion technique is activated, the blue curves (waveshape and spectra) converges quickly to the desired target such as sine multitone, triangular, or even rectangular one. The following figure shows: a) the time-domain waveforms of the uncorrected (red solid) and corrected (blue dashed) acceleration measured at the output of the shaker; b) spectra of the uncorrected acceleration (red) with many higher harmonics; c) time-evolution of first five harmonics after the pre-distortion procedure is started; d) spectra of the corrected acceleration (blue) with almost no higher harmonics (up to 100 dB). Mechanical transducers, such as shakers, loudspeakers and compression drivers that are used as excitation devices to excite acoustical or mechanical nonlinear systems under test are imperfect. Due to their nonlinear behaviour, unwanted contributions appear at their output besides the wanted part of the signal. Since these devices are used to study nonlinear systems, it should be required to measure properly the systems under test by overcoming the influence of the nonlinear excitation device. In this paper, a simple method that corrects distorted output signal of the excitation device by means of predistortion of its input signal is presented. A periodic signal is applied to the input of the excitation device and, from analysing the output signal of the device, the input signal is modified in such a way that the undesirable spectral components in the output of the excitation device are cancelled out after few iterations of real-time processing. The experimental results provided on an electrodynamic shaker show that the spectral purity of the generated acceleration output approaches 100 dB after few iterations (1 s). This output signal, applied to the system under test, is thus cleaned from the undesirable components produced by the excitation device; this is an important condition to ensure a correct measurement of the nonlinear system under test.